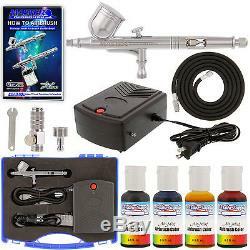 Complete Master Airbrush Cake Decorating Airbrushing System. Precision Dual-Action Gravity Feed Airbrush Set with a Mini Air Compressor and the 4 Most Popular U. Cake Supply Air-Mist Airbrush Food Colors. Has everything you will need to get started! Perfect for bakeries or for private use. Master Airbrush Model G23 Airbrush Set. Multi-purpose high performance dual-action airbrush with a 1/3 oz. Gravity Fluid Cup and a 0.3mm needle & nozzle that allows you to spray from hairline up to 1-1/2 wide patterns. Master Airbrush Model TC-22 Air Compressor. Quiet, portable and lightweight mini 12V DC airbrush compressor with direct plug in 110V AC adapter. 5 Foot Braided Air Hose with Quick Disconnect and Air flow Adjustment Valve. Blow Molded Plastic Storage and Carrying Case. Cake Supply Air-Mist Airbrush Food Coloring Starter Set. 4 of the most popular airbrush colors in 0.5 fl. Bottles: Blue, Yellow, Black and Red. Free HOW TO AIRBRUSH Guide Booklet. Compressor designed for applications that require thin (light viscosity) materials. Temporary tattoos, cake decorating, tanning, nail art, cosmetics, thinned hobby-craft paint, etc.. The Model G23 Airbrush includes a cutaway handle that allows you to quickly clean and flush it while the fluid control knob provides easy trigger adjustment and control of paint flow. Both of these features save you time and increase your productivity. Cake Supply Air-Mist Airbrush Food Colors Features and Benefits. Highly concentrated edible spray-on airbrush food colors that are perfect for airbrushing cakes and gum paste. The concentrated airbrush colors are the brightest and truest colors available, and a little goes a long way. Airbrush food colors are made with high quality FDC approved colors. Comes in easy-to-use flip-top dispenser bottles. We are an authorized dealer for all the product lines we sell. When contacting us please provide full UPC barcode number and/or Model Number off the wrong item you received to speed up the re-order process. NO reorders will be processed without following our policy information proccedure. Defective claims can only be made up to 30 days after receipt of your order. Then send your item back to us with a copy of the original order. SPECIFIC ITEM EXCEPTIONS: PAINT & DVD's - If defective or damaged they will only be replaced. We must have picture documentation of damage emailed to us on all paint related items in order to authorize a replacement order or return authorization. This listing is currently undergoing maintenance, we apologise for any inconvenience caused. The item "Complete CAKE DECORATING AIRBRUSH SYSTEM KIT w-Food Color Set, Air Compressor" is in sale since Thursday, November 29, 2012. This item is in the category "Home & Garden\Kitchen, Dining & Bar\Cake, Candy & Pastry Tools\Cake Decorating Supplies". The seller is "tcpglobal" and is located in San Diego, California.